Drawing down the Moon is a ritual performed on the evening of the full moon. Many Wiccans, Healing practitioners, Spell casters and Witches - both solitary and in Covens see the full moon as a very powerful entity. 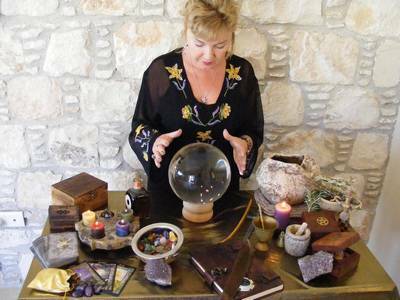 Harnessing this potent power for full moon Spell Casting is a magical and miraculous experience. The Moon is a powerful source of energy. Most witches follow the Moon cycles and plan their magical workings around them, with full moon Spell Casting being the most powerful. I always enjoy Full Moon Spell Casting and Drawing down the Moon rituals. The full Moon simply represents the peak of energy and therefore, should be treated with appropriate respect and reverence. This is the period when the Moon has reached its fullest capacity within the sky and looks like a sphere. This is a time when the Moon is at its most powerful, and the Magic most potent. For Witches performing any positive Spell at this time will achieve good results. Most traditions of witchcraft teach that the full Moon is the single best time to perform rituals or Magic. I think of the full Moon as energy directly linking the Goddess and us. If you have the chance go outdoors on each of the Esbats and bask in the pale light, you are in a special place for seeking healing, transformation and prosperity. Each year there are approximately 13 lunar cycles, in other words 13 opportunities to celebrate the full Moons, otherwise known as Esbats. In various pagan traditions, different systems exist to explain the spiritual significance of each Moon. If you want or need professional and expert help then I can help you. This is your opportunity to have me; Alizon, White Witch and Spell caster personally cast your own powerful Spell. 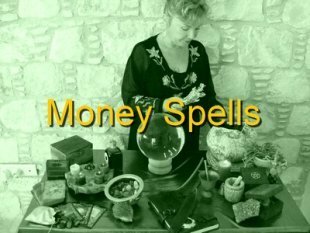 Spells that work with the Law of Attraction are known to be very powerful and enable your wish or desire to be sent to the Universe swiftly and effectively. Occasionally, we are lucky enough to experience, what is known as a Super Moon. A Super Moon is when the full moon appears much larger in the sky. This dramatic vision is very intoxicating and Drawing down the Moon rituals and Full Moon Spell Casting is said to be a very empowering and magical experience. 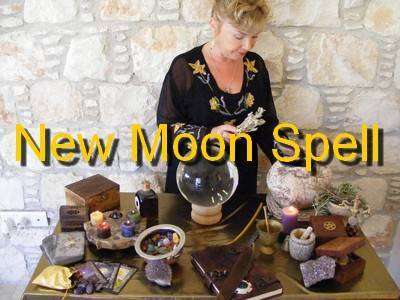 You can try this Full Moon ritual at home and do not need any experience of Spell casting. On the evening of the full moon, go outdoors if possible and prepare yourself mentally for what is about to happen. Try to wear white clothing and silver jewellery. Barefoot is best. With your feet, slightly apart, hold your arms outstretched up to the moon. Look intensely at the full moon, and when you feel ready visualise the full moon beams entering your heart. Visualise a white light flowing throughout your body forming a ball of light deep in your chest. Tense every muscle in your body until you feel ‘fully charged’. Once full charged, and after a period of silent thought or meditation, release the raised energy back to the Universe. You can do this by visualising the ball of light in your chest once more. Again tense all your muscles and begin to ‘push’ the energy upward towards the full moon. Then stand comfortably with your feet apart and thrust your arms upwards and outwards to form a star shape with your body. Exhale and imagine sending this energy out into the air. When this is complete, stand with your feet together and touch each shoulder with opposite arms to form a cross against your chest. This concludes your Drawing down the Moon ritual.